A routine mammogram in August 2013, at Mount Sinai Hospital in Toronto, for Shaare Zedek donor and Board Member Beverly Lyons, would turn into a life-changing experience for the 66-year-old, who was about to make Aliyah to Israel. With no prior history of breast cancer in her family, Beverly received the news from Toronto doctors that there were abnormal changes in her left breast that needed further investigation. 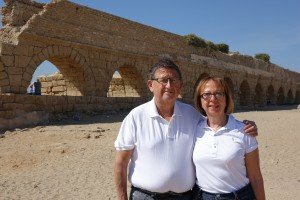 Rather than delay her move to Israel with her husband Elliott, they decided to forge ahead with their relocation and have the changes investigated in Israel at Shaare Zedek Medical Center in Jerusalem. Beverly’s cousin, Dr. Ofer Merin, Deputy Director General at Shaare Zedek, referred her to the new Comprehensive Breast Health Complex at the hospital. There, she was placed under the care of Dr. Shalom Strano, the head of the Diagnostic Center, and one of Israel’s premier breast cancer experts. Everyone she asked in the community confirmed that Dr. Strano was the “best”. Beverly was impressed with Dr. Strano’s extremely thorough and compassionate care as he performed further testing and a biopsy to confirm the diagnosis. Shaare Zedek’s Breast Health Unit is renowned for its patient-centered, integrated healthcare philosophy. The team of professionals offers a comprehensive approach to the services provided to patients coping with breast cancer by including surgeons, oncologists, pathologists, radiologists, personal counselors for support, along with a breast health nurse coordinator who provides continuous guidance and information throughout the process. “I was so grateful to have Susan Ben-Dahan as my Breast Health Nurse Coordinator. She seemed to always be there when I had doctor’s appointments and could explain exactly what was being done and what I should expect. The team, in addition to being extremely professional, was exceptionally caring and supportive. I knew I could contact them at any time with my concerns or questions and they would provide my husband and I with on-going support,” shared Beverly in a recent interview. After diagnosis, Beverly was transferred to the care of Dr. Moshe Carmon, who as head of the Breast Health Clinical Center, is responsible for overseeing the treatment of over 65 percent of breast cancer cases in Jerusalem. Dr. Carmon is a leading surgeon and clinician known for using cutting-edge treatment and for his attention to the unique needs of each woman and her family. Only three months after Beverly’s initial mammogram, her treatments at Shaare Zedek were complete. While this battle may be won, Beverly will continue to be followed by the team at Shaare Zedek with semi-annual visits to monitor her remission. Beverly decided to share her very personal story because she wanted to underscore the importance of “mature” women receiving annual mammograms and the results analyzed by qualified institutions. She is grateful to the Radiologist at Mount Sinai Hospital for her expertise, for without her identification of the abnormal changes, Beverly’s outcome may have been quite different. Finally, it was the outstanding, compassionate and decisive care that she received at Shaare Zedek that is important to share. In recognition of the superb care that she received at Shaare Zedek Beverly and Elliott have made a generous gift in support of our Canadian Foundation’s ambitious $1 million Breast Health Campaign to benefit the Breast Health Clinical Center at Shaare Zedek. With support from donors like Beverly and Elliott, we are hopeful that together we can ensure that Shaare Zedek remains at the forefront of breast cancer research, diagnosis and treatment. We invite you to join our circle of donors and make a contribution to the $1 million Breast Health Campaign. With the support of a circle of generous and committed champions who rise to the challenge, Shaare Zedek Medical Center will transform care for women with breast cancer. If you would like to make a gift in support of the $1 million Breast Health Campaign please contact our office at 416-781-3584. Ten years ago a miracle happened at Shaare Zedek and today we celebrate the life of Shayna Gould, a Chicago native, who miraculously survived a terrorist attack in Israel thanks to the Emergency Trauma Unit at the Shaare Zedek Medical Center in Jerusalem. On January 22, 2002 while standing in downtown Jerusalem on a rainy Tuesday afternoon, a terrorist dressed as an Israeli soldier opened fire, spraying the bus stop and street with bullets. A bullet ripped through my chest and into my lung. Two women were killed during that attack and dozens more, beside me, were wounded. I was taken by ambulance to Shaare Zedek Medical Center and by the time we made it to the hospital, I had no pulse and no blood pressure. I was considered dead on arrival. Through the skilled hands of Dr. Shuli Silberman and Dr. Mahar Deeb, a Jewish and Arab doctor working together, they performed a miracle and brought me back to life. After the surgery, was a long recovery process. My after-care specialist, Dr. Salah Odatallah, stayed by my side through my stay in the ICU and then in the regular ward. But that was not enough. During my stay we formed a strong bond and when I was given permission to return to Chicago, he insisted he fly back with me to ensure my safe return. Eleven years later, I am incredibly fortunate to have survived and hope you will join me in supporting my “Celebrating Life” campaign, raising funds for Shaare Zedek Medical Center’s Emergency Trauma Unit. I was given a second chance by the staff at Shaare Zedek, but because the hospital receives no government funding, they cannot continue to do it alone. Today, I ask you to be a part of saving lives, and become a supporter of Shaare Zedek by making a new pledge or increasing your current gift. With your help, we can guarantee quality healthcare for the people of Jerusalem. Because of people like you, I live a normal life. I am raising a family. I live every day to the fullest and have the opportunity to Celebrate Life. Seven- year-old Dvir Vaknin had been diagnosed with a rare condition called Dent Disease which affects the functioning of the kidneys. Dvir was rushed to the Pediatric ICU at The Shaare Zedek Medical Center after his kidneys started to fail and his parents were losing hope for his recovery. Dvir spent three days hovering between life and death. On the third day however, Dvir made a sudden and dramatic turnaround and his kidneys started to function again. sult of the state of the art treatment and care, Dvir’s condition continued to improve substantially each day. 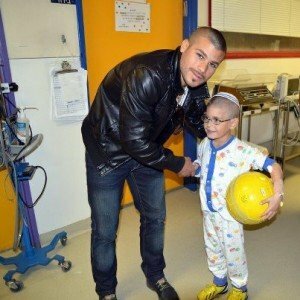 Dvir’s lifelong dream has always been to meet beloved Israeli soccer hero Kobi Moyal. On February 7th after a being in the Pediatric ICU for several weeks, the Shaare Zedek staff helped make his dream come true by surprising him with a visit from his idol. A smiling Dvir was released from the hospital to his relieved parents a couple of weeks later and he has continued his recovery at home. He will continue to receive outpatient treatment at Shaare Zedek and his condition is expected to improve over time. Dvir and his family are so thankful for the compassionate care they received at Shaare Zedek.